Fig. 1. Mitogen activated protein kinase (MAPK) signalling pathways mediate responses to a variety of stimuli, including ROS. 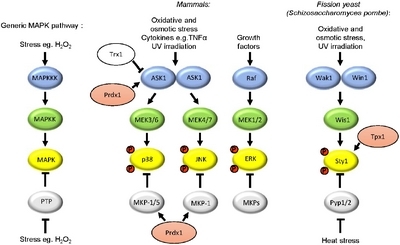 MAPK pathways consist of a series of kinases: MAPKKK, MAPKK and MAPK, which are sequentially activated by phosphorylation. Three groups of MAPK, p38, JNK (c-Jun N-terminal kinase) and ERK (extracellular signal-regulated kinase), are preferentially activated by different MAPKK and MAPKKK. The activity of each kinase is also controlled by phosphatases. For example, to attenuate MAPK activity, protein tyrosine phosphatases (PTPs) dephosphorylate MAPK. Oligomerisation activates ASK1 by promoting autophosphorylation. Inactivation of phosphatases is an alternative mechanism to increase MAPK activity. 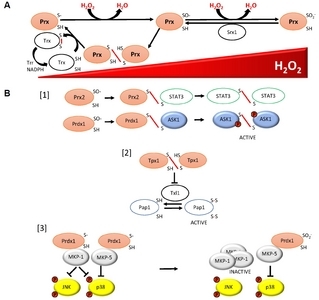 For example, heat stress activation of the Sty1(Spc1) pathway in the fission yeast Schizosaccharomyces pombe involves inactivation of the PTP Pyp1 (). Steps in pathways which have been shown to be regulated by peroxiredoxins (pink) and/or thioredoxin (Trx1) are also indicated. Fig. 2. Mechanisms underlying roles of peroxiredoxin and thioredoxin family proteins in responses to increasing concentrations of hydrogen peroxide, including MAPK activation. (A) Prx can inhibit H2O2 signalling, including activation of p38 MAPK, by reducing the levels of H2O2 available to activate these pathways: The peroxidatic cysteine residue of a peroxiredoxin (Prx) reacts with H2O2 to form a sulphenic acid derivative (?SO?). In the catalytic cycle this is followed by the formation of a disulphide bond between this cysteine and the resolving cysteine of a neigh-bouring Prx. The resulting Prx disulphides are reduced by thioredoxin family proteins (Trx) by thioredoxin reductase (Trr) using electrons from NADPH. At high concentrations of H2O2, the peroxidatic cysteine can become hyperoxidised to a sulphinic acid (?SO2? ), which can be reduced by sulphiredoxin (Srx1) back to the ?SO? form. (B) Three mechanisms by which different redox forms of Prx have been shown to promote H2O2 signalling:  Prx2 is able to promote activation of STAT3 through transient formation of Prx2-STAT3 disulphides, which is followed by STAT3-STAT3 disulphide-linked oligomers, resulting in STAT3 activation (). Similarly, Prdx1 forms disulphide bonds with ASK1, resulting in ASK1-ASK1 oligomers and ASK1 activation (). In S. pombe, Tpx1-Tpx1 disulphides are the main substrate for Trx1, therefore the presence of Tpx1 disulphides prevents the thioredoxin activity of Trx1 and Txl1 towards other substrates, such as the transcription factor Pap1 (). At low concentrations of H2O2 in human malignant breast epithelial cells, Prdx1 associates with two MAPK phosphatases, MKP-1 and MKP-5, inhibiting the activity of the MAPK p38, with MKP-1 also dephosphorylating JNK. However, at concentrations of H2O2 when Prdx1 is hyperoxidised, Prdx1 dissociates from MKP-1, resulting in oligomerisation and inactivation of MKP-1 towards p38 and JNK. The association between Prdx1 and MKP-5 is maintained even when Prdx1 is hyperoxidised, allowing MKP-5 to dephosphorylate p38 (). Gutteridge, J.M.C., and Halliwell, B. (1999). Free Radicals in Biology and Medicine. Oxford, UK: Oxford University Press. Holmstr?m, K.M., and Finkel, T. (2014). Cellular mechanisms and physiological consequences of redox-dependent signalling. Nat. Rev. Mol. Cell Biol.. 15, 411-421. Ol?hov?, M., Taylor, S.R., Khazaipoul, S., Wang, J., Morgan, B.A., Matsumoto, K., Blackwell, T.K., and Veal, E.A. (2008). A redox-sensitive peroxiredoxin that is important for longevity has tissue-and stress-specific roles in stress resistance. Proc. Natl. Acad. Sci. USA. 105, 19839-19844. Vivancos, AP1, Castillo, EA, Biteau, B, Nicot, C, Ayt?, J, Toledano, MB, and Hidalgo, E. (2005). A cysteine-sulfinic acid in peroxiredoxin regulates H2O2-sensing by the antioxidant Pap1 pathway. Proc. Natl. Acad. Sci. USA. 102, 8875-8880. Wood, Z.A., Schr?der, E., Robin Harris, J., and Poole, L.B. (2003). Structure, mechanism and regulation of peroxiredoxins. Trends Biochem. Sci.. 28, 32-40.